Sea otters (scientific name: Enhydra lutris) can be found in shallow water areas in the North Pacific Ocean. They especially like to reside in waters with kelp beds. Sea otters use the kelp to wrap themselves in when they are resting. Sea otters once ranged from Mexico to Alaska and Japan. The current population of sea otters in California is about 3,000, primarily distributed from just south of San Francisco down to Santa Barbara County. A very small relocated population resides in Southern California at San Nicolas Island of the Channel Islands. A much larger population exists in Alaska (more than 70,000 individuals), and a sizeable population (estimated at more than 25,000 sea otters) exists in Russia. Sea otters do not migrate and hardly ever travel far unless they are in search for food. Sea otters are the smallest marine mammals. Sea otters are members of the weasel or Mustelidae family and are closely related to the mink and river otters. Since otters spend most of their time in the water, their hind feet are webbed and adapted for swimming. Their front feet have short toes used to grab and handle food. Sea otters are very clumsy on land and usually can't be seen more than a few meters from the water. Length and Weight: Adult male sea otters weigh 70 - 90 pounds (32 - 41 kg) with some individuals reaching 100 pounds (45 kg). Adult female sea otters weigh 30 - 60 pounds (14 - 27 kg). Adults grow to be about 4.5 feet. Fur: A sea otter's fur is the thickest and finest of any mammal. They have 850,000 to 1,000,000 hairs per square inch consisting of two layers, an undercoat and longer guard hairs. The sea otter uses air trapped between their hairs to keep themselves insulated in cold waters. If the hair gets soiled with substances such as oil, insulation is lost and the sea otter has trouble maintaining body heat. For this reason, sea otters spend much of their time grooming themselves in order to keep their fur in good condition. Color: A sea otter's undercoat ranges from brown to almost black in color. Guard hairs may be silver, pale brown or black. Older otters tend to have a silvery head. Sea otters are social animals. They can be found in pods of less than ten individuals to pods of more than 1,000 animals. Females and pups spend time in one group, while males spend time in another. When a pup is born, it spends the first eight months with its mother. A pup's fur traps so much air that it cannot dive under water. While a mother sea otter dives to get food for her pup, she leaves the pup wrapped in the kelp, bobbing on the surface. Mothers groom their pups a lot and often carry them on their chests. At around four weeks of age, a pup begins to learn how to swim. Sea otters are the only marine mammals to use tools. Sea otters use a rock or hard object to break open shellfish or other food. Females usually have their first baby pup at the age of four or five. A female is pregnant for four to five months. Sea otters mate during all times of the year and pups can be born during any time of the year. In California, pups are usually born between the months of January and March and in Alaska pups are usually born during late spring. When a pup is born, it may weigh between three to five pounds (1.35 to 2.26 kg) and it is light brown in color. Sea otters live for approximately 15 to 20 years. 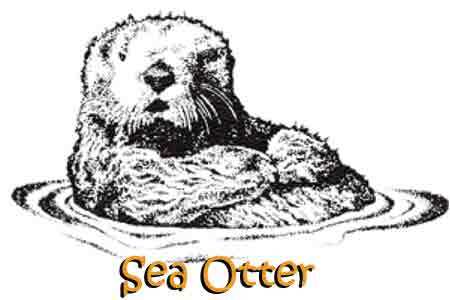 Sea otters mainly eat sea urchins, crabs, clams, mussels, octopus, other marine invertebrates, and fish. In order to capture food, sea otters dive to the bottom in 5 to 250 feet (1.5 to 75 meters) of water. A feeding dive usually lasts from less than a minute to as long as 5 minutes or more. During a dive, the sea otter collects and stores the food in the loose skin flaps of its armpit. Once an otter collects its food, it surfaces, rolls onto its back, places the food on its chest and continues to eat the prey with its forepaws. If the prey has a hard outer shell, the otter will hit it against a rock or hard object in order to break the food source open. Sea otters always eat in the water and never on land. Hunting for food is one of the most important daily activities for the sea otter. They need a lot of food so that they stay healthy. Adult sea otters can eat 25% - 30% of their body weight in one day! Sea otters have the thickest fur of any marine mammal, averaging 850,000 to 1,000,000 hairs per square inch! Sea otters wrap themselves in kelp while resting. Sea otters are the smallest marine mammals!